Still not sure about registering? Watch this race video, then register below. Swim: The swim is a rectangular shaped course tucked into crisp, clear waters of 500 acre Marsh Creek Lake. There are two (2) yellow triangle swim buoys on the course that athletes will go around. There will be orange round buoys for sighting placed every 75-100 meters. We expect water temperatures to be in the low 70’s on race day; definitely wetsuit legal. We will post a preliminary water temperature the Friday evening prior to the event with an official reading taken and posted by our USAT officials race morning. 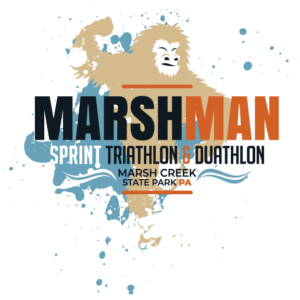 Bike: The Marshman bike course is epic. Well paved roads, great scenery and trout streams welcome cyclists as they race around the lake and its watershed. With all right hand turns, this course feels like a racetrack through the forest with a rolling combination of false flat with a few technical sections that will get you out of the saddle. This an honest course as it rewards bike handling skills and the endurance of the hard charger. However, it is also a lovely course with uphills and forested valleys, hence perfect for the slower athlete as well. Athletes will do one (1) loop of the bike course and re-enter the park for T2. Run: The run course is a 1 loop, 5k course throughout the park. The first mile weaves through the boat ramp area before heading to the upper section of the park near the park swimming pool. Then it loops back around the race site, continuing along the lake to the finish line. The running trails are well maintained and there are aid stations every mile. The last half mile is through the grass and pops out in front of the finish line. The September views along the lake are amazing, you can’t race this race just once. Duathlon: The Duathlon will start with a 1.25 mile run and will start at 7:30am with the first wave of the Triathlon. The first run will start near the finish line and will be an out and back run to end at the Transition Area where the swimmers come in. The Bike and Run courses are the same as the Triathlon. You’ll love our swag! All athletes receive a Tri-Blend Race Shirt, Custom Race Socks and a super cool custom Finishers Medal. Don’t forget the bounce house for the kids and the fabulous post race spread. Lastly, no swimming in Marsh Creek Lake outside of the race. Please help us maintain our great relationship with the park and follow the rules. Transition Area Rules: Please note that bicycles will not be released from the transition area until the bike cut off time (2 hours from the last wave) or the last cyclist enters transition. The parking lots exit directly on to the bike course and we need to make sure the course is clear prior to allowing 500 cars on the road. Thank you for your understanding and patience in this matter. Pre-Race Briefing: 7:15 AM at swim start. Pre-Race Meeting: An extensive pre-race meeting will take place at 6PM on Saturday. If this is your first race, come to this meeting to have your questions answered. A second brief meeting will occur 15 minutes prior to the first wave on race morning.